NOTE: This promotion is not available on the Windows App, Tablet Apps, and iPhone 4 and below. Please read these terms and conditions (“T&Cs”) before entering the Amazon Treasure Hunt Promotion (“Promotion”) on the mobile application of www.amazon.in (hereinafter referred to as the “App”). 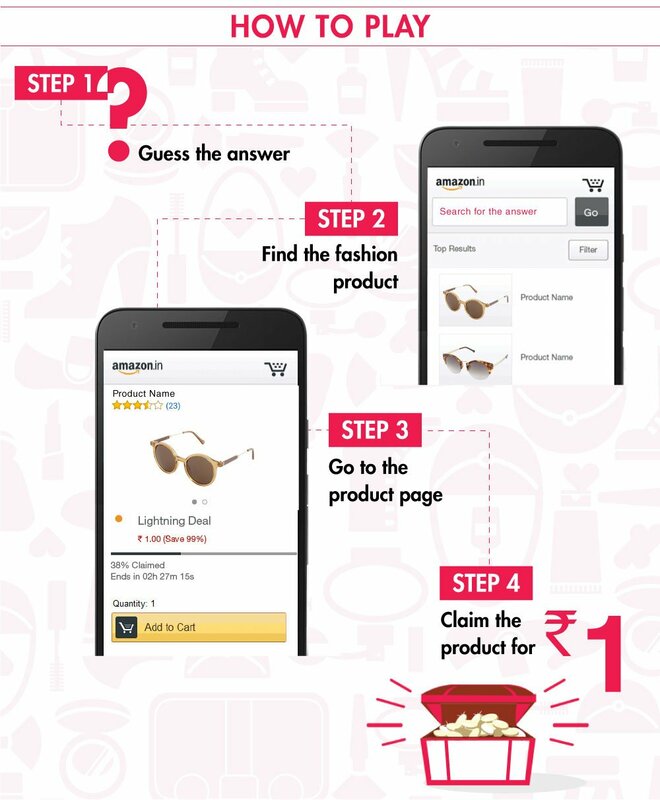 This Promotion is applicable only on the App and not on the website or mobile website of Amazon. This Promotion will be available beginning 10:00 am and ending 4:00 pm on 10th March 2015 (the “Promotion Period”). During the Promotion Period, at an interval of every 15 minutes commencing from 10:00 a.m. until 4:00 p.m. of such day, Amazon will be displaying a clue to a product listed on the App (such product hereinafter referred to as “Product”) on the Promotion page of the App. e not responsible for: (a) lost, misdirected, late, incomplete, or unintelligible entries or for inaccurate entry information, whether caused by you or by any of the equipment or programming associated with or utilized in the Promotion, or by any technical or human error that may occur in the processing of entries; (b) any printing or typographical errors in any materials associated with the Promotion; (c) any error in the operation or transmission, theft, destruction, unauthorized access to, or alteration of, entries, or for technical, network, telephone, computer, hardware or software, malfunctions of any kind, or inaccurate transmission of, or failure to receive any entry information on account of technical problems or traffic congestion on the Internet or at any website; or (d) injury or damage to your or any other computer or mobile resulting from downloading any materials in connection with the Promotion. We may, in our sole discretion, disqualify any individual found to be: (a) tampering with the entry process or the operation of the Promotion or website or mobile application; (b) acting in violation of these T&Cs; or (c) acting in an unsportsmanlike or disruptive manner or with intent to annoy, abuse, threaten or harass any other person. If your entry is incomplete or if you use robotic, automatic, programmed or similar entry methods, your entry will be void. The authorized subscriber of the e-mail account used to enter the Promotion at the actual time of entry will be deemed to be the participant and must comply with these T&Cs in the event of a dispute as to entries submitted by multiple users having the same e-mail account. The authorized account subscriber is the natural person who is assigned an e-mail address by an internet access provider, on-line service provider, or other organization responsible for assigning e-mail addresses for the domains associated with the submitted e-mail addresses. No benefits greater than those described in the “Description of the Promotion and How to Enter” section above in these T&Cs will be awarded.